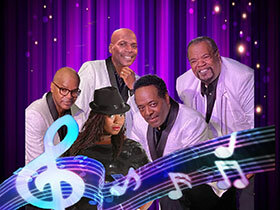 “Motown Downtown” brings Branson the sound that put Detroit music on the map! Hear big hits from Motown recording artists like The Temptations, Supremes, and Marvin Gaye, as well as your favorites from other pop and soul artists from the first three decades of rock ‘n roll, like The Spinners, Sly & the Family Stone, and Chubby Checker. And you’ll be enjoying this sensational music courtesy of seven fabulous vocalists, each of them dressed to fit the era that called for elegant, coordinated attire; it’s truly a nice touch of class! Some of the songs you’ll be singing along to include; Dance to the Music, Come See About Me, Heat Wave, Under the Boardwalk, Get Ready, and My Girl. And you’ll enjoy this fun show in the up-close-and-personal setting of a small, cozy theater setting in Branson’s Historic Downtown. You’d have to search far and wide to find someone who doesn’t have a favorite Motown song, or a much-loved song from one of the fabulous soul singers of the 50, 60’s, and 70’s, making “Motown Downtown” the ideal show for anyone who simply loves incredible music!